Warm a small amount between the hands and apply to damp skin, in small circular motions, working from extremities towards the heart. Use 2-3 times per week. NOTE: You may wish to add a preservative if you are concerned about any water getting into the pot. 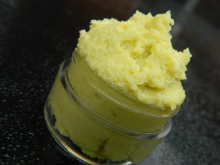 · Heat the mango butter, stearic acid, SSL and P80 until they are completely melted. Add the hemp seed oil and stir well. · Stir in the salt a little at a time and then whip with a balloon whisk. · Place in a pot and put in the fridge for 2-3 hours, until set.